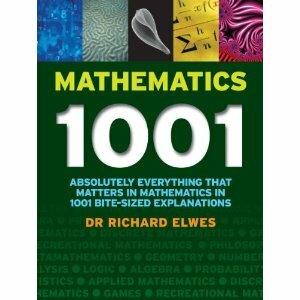 • Richard Elwes, Mathematics 1001, Quercus Books, 2010. • what’s the equation of a straight line? • what are the basic identities that trig functions obey? • how do you prove the product rule in calculus? • What’s Goldbach’s conjecture and how much evidence do we have for it? • What’s the golden ratio? • What’s a Koch snowflake? • What’s the abc conjecture? • What’s a Julia set? • What’s Chaitin’s number Ω? • What’s Tarski’s geometric decidability theorem? • What’s the Cauchy-Schwarz inequality? • What’s a Fourier series? • What are grad, div and curl? • What’s the classification of closed surfaces? • What’s a permutation group? • What is a scheme? • What’s the Langlands program? • What’s a derived category? The more advanced topics are covered in a sketchy way, so you will not walk out knowing complete answers to all these questions. And that’s just as well, because otherwise the book would be a lot longer than 409 pages, and nobody would be able to read it all! What you will get is some rough sense of all what all these things are… and you’ll have a lot of fun in the process. You can start reading the book anywhere: it’s not a treatise, it’s a bunch of tasty appetizers. So, you can set it by your bed or somewhere in the living room, and dip into it whenever you have some spare time. I really, really wish I’d had a book like this when I was younger. Math is a huge enchanted kingdom with many highways and byways, dark forests and dragon-infested mountain ranges. It took me decades to wander across it, extricate myself from various tar pits, and get some sense of the overall lay of the land. This book would have sped that process immensely, in a very pleasant way. So if you’d like to know more about math, get this book! And if you know a kid, or friend, who is interested in math but not yet an expert, give them this book! By the way, if you saw the recent post Richard Elwes and I wrote on Babylonian mathematics, you may think it’s some sort of conflict of interest for me to be touting his book now. However, that would be putting Descartes before the horse! In fact what happened is this. He sent me a copy of his book, I liked it, I wanted to post an article about it, I saw an interesting post of his about a Babylonian clay tablet on Google+, I decided to expand it with him here on this blog, and finally I’m talking about his book! This entry was posted on Tuesday, December 6th, 2011 at 11:00 am and is filed under mathematics. You can follow any responses to this entry through the RSS 2.0 feed. You can leave a response, or trackback from your own site. Thanks! This sounds like a great book for the right person. There was a two-year gap between seeing this post and me acting on it, but I wanted to add another positive review for this book. I got it for my daughters for Christmas, and it was a coffee table book for a while. Recently, it has migrated to one of my daughter’s personal bookshelves. If you knew anything about this girl’s history with mathematics, you’d know how remarkable that is. So thanks for pointing this out — would never have found it on my own. I forwarded your review to Richard Elwes! I’m glad your daughter likes it. One of my favorite popularizers! ALL of Richard’s books are great (look ’em up on Amazon), especially for up-and-coming math lovers.